In stock -This product will ship today if ordered within the next 10 hours and 28 minutes. Dr Bronner`s Organic Light Style Peppermint Hair Creme provides light styling hold while making hair silky soft without any synthetic ingredients. Organic virgin coconut oil makes hair shiny & luxurious, organic jojoba oil imparts excellent manageability and feel, while the organic hemp oil moisturises and softens hair. Water, Organic Coconut Oil*, Organic Ethanol, Organic Jojoba Oil, Organic Hemp Oil, Organic Peppermint Oil, Organic Quillaja Saponaria Extract, Xanthan Gum, Tocopherol. After showering, add some extra styling and smoothness to your hair by using this Fair Trade and organic Hair Creme. Put a small amount of Hair Creme in your hand and comb gently through your hair, with a focus on the ends. Apply as much as you need to give your hair a well-moisturised, lightly-styled look and feel. Below are reviews of Dr Bronner`s Peppermint Styling Hair Creme - 177ml by bodykind customers. If you have tried this product we'd love to hear what you think so please leave a review. 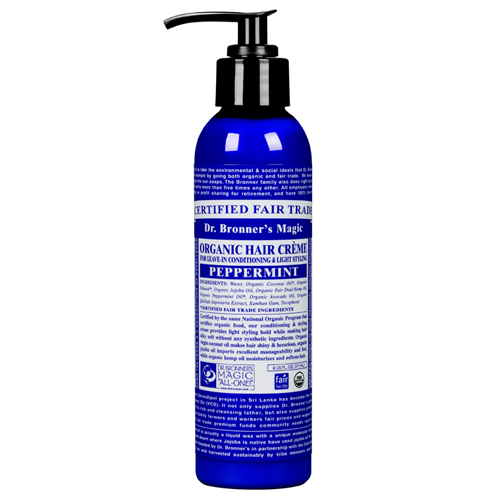 Dr Bronner`s Organic Light Style Peppermint Hair Creme provides light styling hold while making hair silky soft without any synthetic ingredients.